This adorable bear is Blazer Blake, the latest of our occasional Blazer Boys. We have not had any for a while, so if he is the boy for you, don't delay for too long. Blazer Blake is 5" tall and is made of gorgeous bright fox red German alpaca, soft and dense. For his blazer we have used silky soft apple green Schulte mohair which has a longer pile length than the alpaca, this makes his jacket appear very fluffy. He has brown cashmere pads and paws, an apple green stitched nose and three green buttons down his jacket. We have filled him with steel shot and steel balls to give him weight and he has shiny black German glass eyes with a twinkle in them! 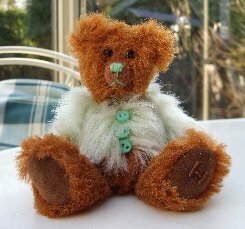 I love this little bear, I think he is really sweet and in gorgeous colours, I hope you like him too. He costs £45 plus postage. Please note that as with all our bears, Blazer Blake is not a toy and is not suitable for children. Sorry - Blazer Blake has been adopted.